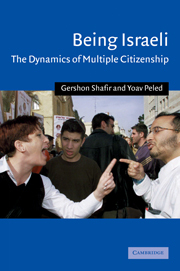 This penetrating and timely study by two well-known scholars offers a theoretically informed account of the political sociology of Israel. The argument is set in its historical context as the authors trace Israel's development from the beginning of Zionist settlement in Palestine in the early 1880s to the Oslo accords in 1993, and finally to the recent Palestinian uprising. Against this background, they speculate on the idea of citizenship and what it means to be the citizen of a fragmented and ideologically divided society. 1. Introduction; Part I. Fragmented Citizenship in a Colonial Frontier Society: 2. The virtues of Ashkenazi pioneering; 3. Mizrachim and women: between quality and quantity; 4. The frontier within: Palestinians as second-class citizens; 5. The wages of legitimation: Zionist and non-Zionist Orthodox Jews; Part II. The Frontier Reopens: 6. New day on the frontier; 7. The frontier erupts: the Intitfadas; Part III. The Emergence of Civil Society: 8. Agents of political change; 9. Economic liberalization and peacemaking; 10. The 'Constitutional Revolution'; 11. Shrinking social rights; 12. Emergent citizenship groups? Immigrants from the FSU and Ethiopia and overseas foreign workers; 13. Conclusion.